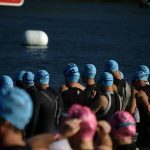 From why you should train and race with a nose clip to the best nose clip for swimming, here’s your guide to the tool that plugs your nose in the water! 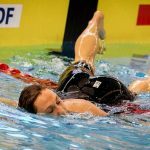 For the competitive (or even recreational) swimmer the nose clip might be something you have always considered was solely for the synchro swimmers in the next lane. Or at least, not so much anymore. 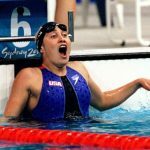 With swimmers such as Missy Franklin and Tyler Clary making the nose clip “cool” we are seeing it being used more and more often in competition and in practice. While plugging your nose might seem like the last thing you want to do when you are already gasping and huffing for air while at the pool, the nose clip can do some pretty cool stuff for your swimming. Stop water from going up your nose. This can happen in a few different instances: when you aren’t exhaling properly during a flip turn, while swimming backstroke, and as I’ve experienced on more times than I care to admit, when wearing a snorkel. A nose clip is particularly beneficial as a piece of swimming equipment for beginners as it helps you with breath control, something that a lot of newbie swimmers struggle with as they learn to work out breathing patterns and doing a flip turn without water streaming up their nose. When I first started out using a swimmer’s snorkel in practice things didn’t always go very smoothly. I struggled purging the water properly, and when I was tired water would often leak into my nostrils because I was too fatigued to maintain proper air pressure in my face holes. The result was usually getting a fair amount of water up my nose and into my sinuses. When this happens you end up sneezing and sniffling usually for the rest of the day while the chlorinated water runs its course. Putting a nose clip and a snorkel on at once can be a little nerve-wracking for the first timer, so ease into using both pieces of swim equipment at the same time by beginning with floating in the pool, swimming, and eventually graduating to doing flip turns. Nose clips make it easier to extend your underwater dolphin kicking off the walls. 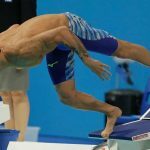 Everyone wants a faster underwater dolphin kick—but there’s a reason so few swimmers master it: holding your breath repeatedly for enough time to get enough reps to improve is difficult. A nose clip will help you hold your breath (avoiding oxygen from leaking out your nostrils when on your back), and even help make the transition into your breakout smoother. As head coach of the University of Wisconsin Badgers swim program, Whitney Hite asks his swimmers to perform eight dolphin kicks off every single wall in swim practice and in competition. Using a nose clip helped the swimmers hit that target more often in training, and consequently, in races too. And for those of you who worry that wearing a nose clip will feel awkward and weird? The learning curve is quick. “We took two or three days to ease into training, but then it started becoming natural to me as well as the others I train with,” noted Badger distance swimmer Jenny Holtzen . More and more often we are seeing NCAA sprinters use them as well—wearing a nose clip makes swimming a 50-yard freestyle with no breath much easier when you don’t have to worry about air leaking out at the flip turn. 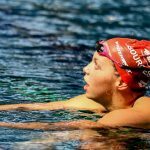 Most swimmers don’t think about the air in their lungs providing a benefit to their swimming, but there is a huge one. 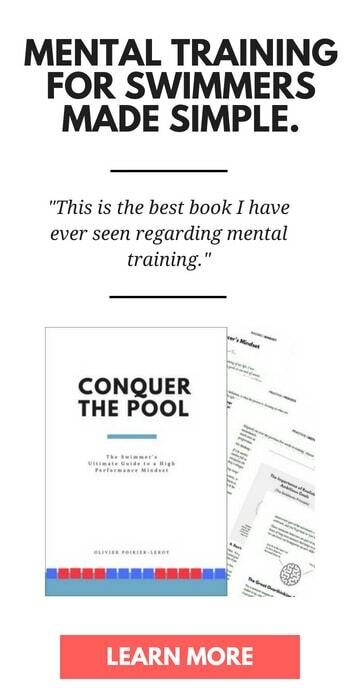 Go to the pool, hop in, and exhale completely. Off to the bottom you go, right? Take a big breath and hold it, and you will notice that you float. By keeping that air in your lungs with the help of a nose clip you are helping your body stay more buoyant in the water. 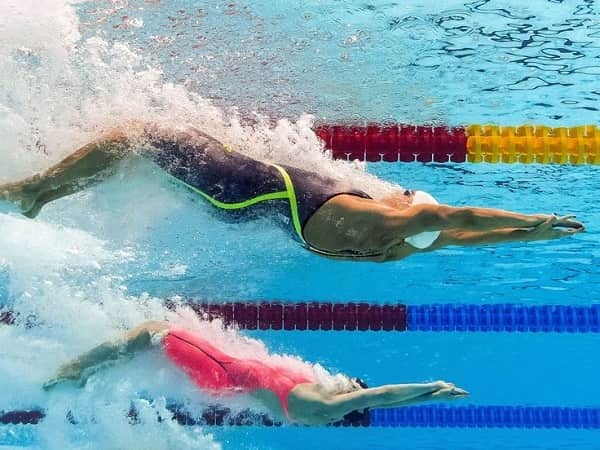 With more buoyancy usually comes less drag (you are skimming across the surface of the water, after all), you explode to the surface faster, and your body position is generally better in the pool. There is a reason that nose clips started their invasion into the upper echelon of swimming with backstrokers. The nose clip helps them seal off the exit of air when they are kicking out off the walls. Unless you have the impressive and rare ability to plug your nostrils with the top of your lip, air is going to bubble out of your nose when you are kicking on your back under the surface of the water. Alrighty, so the benefits of wearing a nose clip while swimming sound legit. Awesome, even. So the next step is picking up a pair and giving them a rip down at the pool. The good news is that you can’t really go too wrong picking out a couple different types to see which hug your nose and don’t slip off. 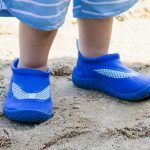 They are also cheap, which comes in particularly handy seeing as you will lose them much more frequently than your other swim gear. Here’s a breakdown of the most popular and best nose clips for swimming. Speedo is one of the leading swim manufacturers on the planet. From tech suits to swim goggles they make it all for the chlorinated athlete, so it’s no surprise that they make nose clips for swimmers. 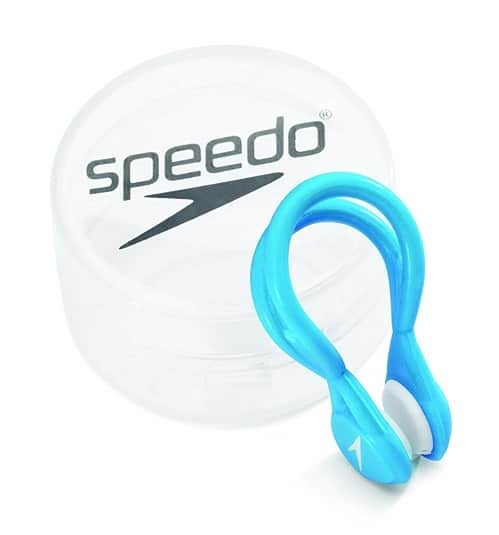 Popular with synchronized swimmers as well (and if anybody “nose” nose clips it’s them—har har), the Speedo Competition Nose clip is the classic choice for swimmers. They come with a case, which makes losing them slightly less frequent. It also has a low profile fit with a rubber-coated stainless steel wire frame. The frame itself is bendable so that it can adjust to the width of the bridge of your nose. 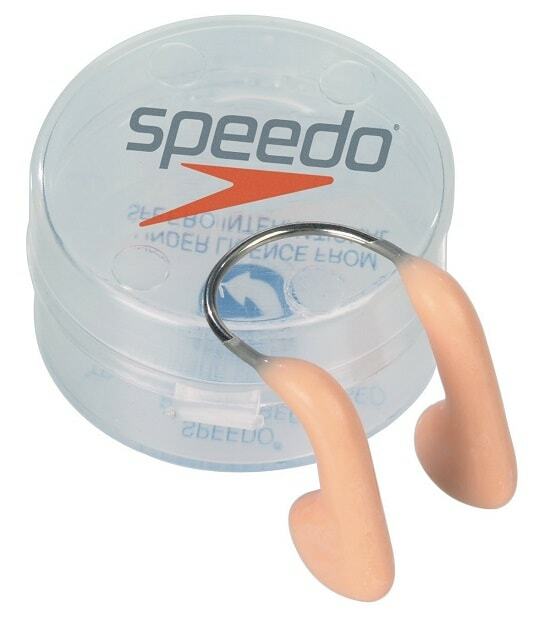 Speedo Liquid Comfort Nose Clip. This one is bright as a neon Smurf, and instead of the wire that holds together the Speedo Competition Nose Clip this model is housed on a nylon frame. 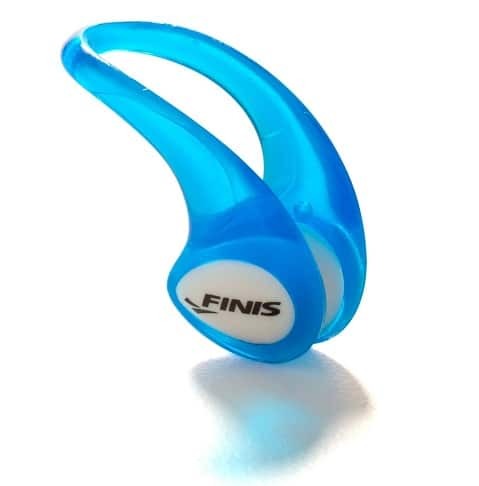 I’m a big fan of FINIS swim gear, from their Tempo Trainer Pro to their Duo waterproof MP3 player. Their nose clip is brightly colored (so you might lose it a little bit less than the clear or beige ones that disappear into the depths of your swim bag or even worse—the bottom of the pool), comes with a carrying case, and I’ve found that they require little adjustment once you put them on your face. 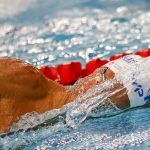 The Best 8 Swim Caps for Swimmers. 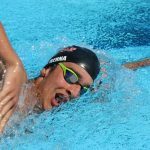 Looking for the best swim cap for training and competition? Here’s your ultimate guide to picking out the best swimming cap for you. The 7 Best Goggles for Swimming. Confused about what kind of goggles to get? Here’s a breakdown on the best swimming goggles for fast swimming.